Which Brands of Yogurt Are Gluten-Free? 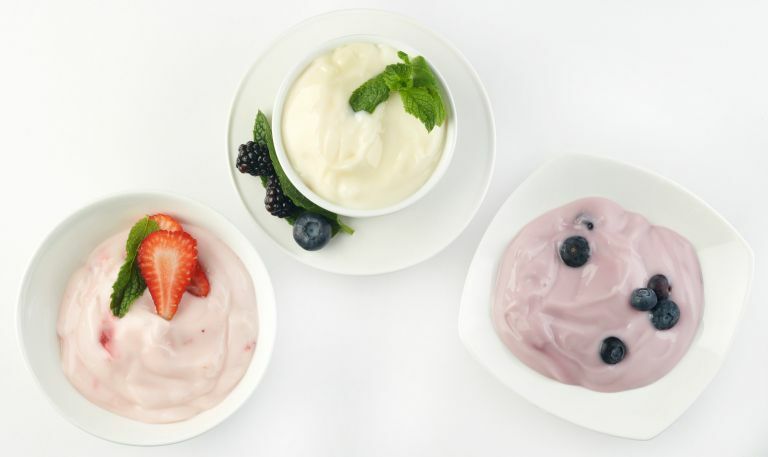 Plain yogurt is made with milk that's been fermented with friendly bacteria until it thickens and develops a tangy taste. In its pure form, yogurt is gluten-free, and you can enjoy it on the gluten-free diet, assuming you're not also steering clear of milk products due to lactose intolerance or another issue. However, the flavorings and sweeteners used in commercially available yogurt aren't always gluten-free. In addition, even plain yogurt you buy in stores can be subject to gluten cross-contamination that makes it unsafe for those of us with celiac disease and non-celiac gluten sensitivity. Here's the list of yogurt brands that are commonly available in the U.S., plus what each manufacturer has to say about whether the yogurt is gluten-free or not. Cabot yogurt. If your supermarket stocks Cabot yogurt, I can recommend it, even if you're particularly sensitive to trace gluten. The Vermont-based company (known for its sharp cheddar cheese) produces Greek-style yogurt in seven different flavors and fat levels, including plain, low-fat, non-fat, strawberry and vanilla bean. The company states that "all of Cabot's products are gluten-free. Any and all ingredients, anti-caking agents, etc. are researched and verified to be gluten-free." Chobani yogurt. Chobani offers plain thick Greek yogurt, plus a variety of different flavors ranging from the basics (strawberry and vanilla) to more interesting varieties (Blood Orange and Vanilla Chocolate Chunk). According to the company, "Chobani Greek Yogurt varieties, with the exception of Chobani 'Flip' products, are naturally gluten-free. This means they contain no wheat, rye, barley or other gluten-containing ingredients. All of our products containing no gluten are marked with the gluten-free symbol as certified by the Gluten-Free Certification Organization" (GFCO). The GFCO requires products to meet the legal standard of fewer than 20 parts per million of gluten. Note that Chobani uses certified gluten-free oats to make its Chobani Oats and Ancient Grain products, which makes them safe on the gluten-free diet (as long as you can eat oats). Dannon yogurt. Dannon offers a huge variety of flavors and styles of yogurt, and the vast majority of them are considered gluten-free. The exceptions include Activia Fiber (contains gluten ingredients), Dannon Parfait (which is sold only in cafeterias, not in grocery stores), Oikos Low Fat Greek Frozen Yogurt, Oikos Crunch, LNF Greek Crunch, and YoCrunch. Fage yogurt. Greek yogurt maker Fage offers those split cups with fruit or a honey-based topping on one side and yogurt on the other. All flavors are considered gluten-free and are certified by the Gluten-Free Certification Organization, according to the company. Stonyfield Farm. Stonyfield Farms makes yogurt and smoothies, plus Oikos organic Greek yogurt. It also makes YoBaby yogurt products and soy yogurt for those who avoid dairy along with gluten. All Stonyfield yogurts with the exception of YoToddler Plus Fruit & Cereal are certified gluten-free by the GFCO, which means they contain fewer than 10 parts per million of gluten. The company also makes frozen yogurt products. These don't contain gluten ingredients but are produced on equipment shared with gluten-containing products, so Stonyfield doesn't consider them to be gluten-free. Yoplait yogurt. Yoplait, part of General Mills, features an extensive gluten-free list. A spokesperson said the gluten-free list includes most—but not all—Yoplait products. Notably, the gluten-free parfaits with granola are not gluten-free (they contain regular oats and barley malt). Yoplait products are tested to 20 parts per million. If you have kids, GoGurt and Trix both are Yoplait products, and there are many of both on the gluten-free list. In addition to these national brands, most grocery stores also carry their own "private label" brands. To determine if these are considered safe or not on the gluten-free diet, you'll need to ask the store—many offer gluten-free lists of products. Just as with regular yogurt, many brands and flavors of frozen yogurt are safe. However, some are not. The gluten-free ice cream article provides some details on frozen yogurt you can purchase in stores. Finally, if you enjoy going out for frozen yogurt, there are also gluten-free frozen yogurt options that you can enjoy safely and what you should avoid.